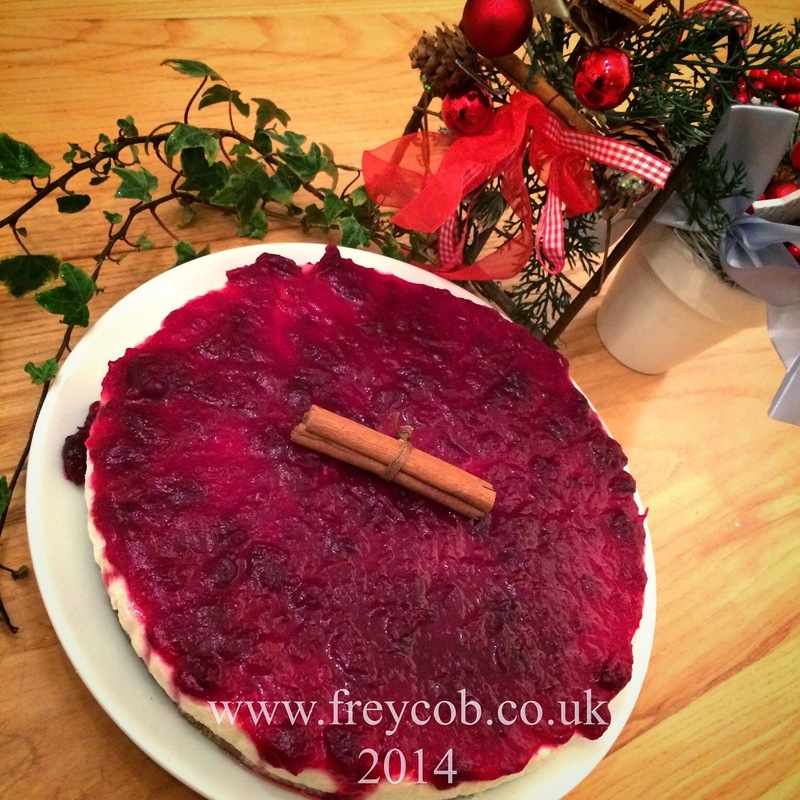 I was invited to take part in a Mistletoe and Quark food blogger challenge to come up with a recipe using the Lake District Dairy Co. Quark. Originally I intended to make a cheesecake but the final outcome is more like a pannecotta; with that hint of a wobble (a bit like my thighs, some may say!) and one which I’m very pleased with too. 1. Line a 20cm/8″ spring form tin with baking parchment. 2. Crush the Digestive biscuits and add the ground cinnamon. 3. Melt the butter, pour onto the biscuits and cinnamon then mix thoroughly. 4. Tip the biscuit and butter mix into your prepared tin and press well down into an even layer. 5. Place into the ‘fridge to chill. 6. Place the gelatine leaves in a bowl of cold water for 5-6 minutes until softened. 7. Heat the orange juice in a small saucepan until warm. 8. Squeeze the water from the gelatine leaves and add to the warmed orange juice, then heat together gently until the gelatine has dissolved. Remove from the heat and leave to cool for 5 minutes. 9. In a large bowl, whisk together the Philadelphia cheese, Quark, icing sugar and vanilla bean paste. 10. Gradually pour in the orange juice and gelatine mixture in a slow stream whilst continuing to whisk until combined. 11. 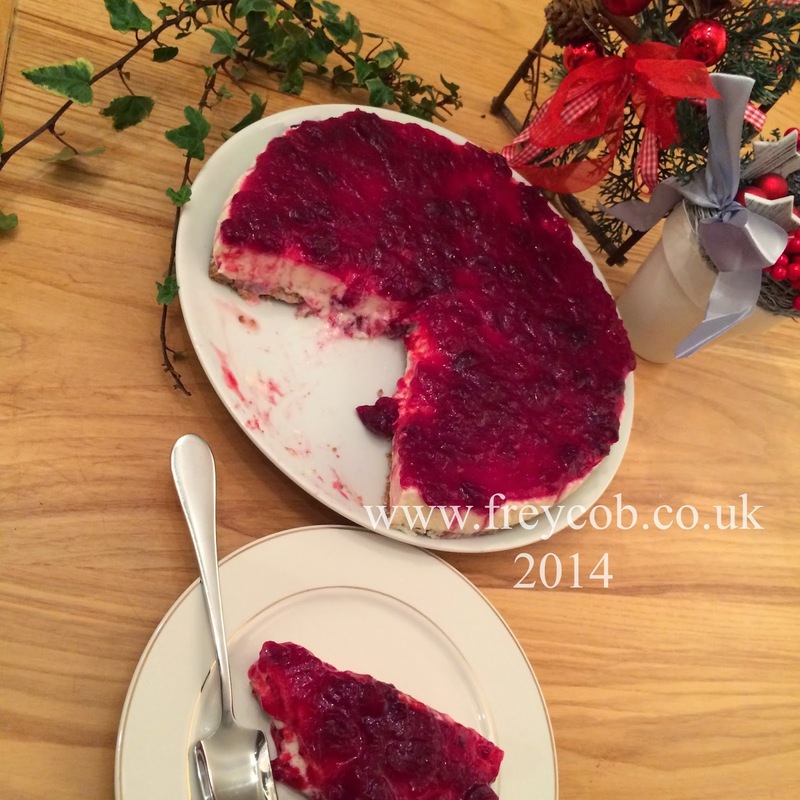 Pour this Quark mixture over the chilled biscuit base, smooth the top and leave in the ‘fridge to set overnight. 12. In a saucepan, place the cranberries, orange zest and juice with the sugar. 13. Bring to the boil then continue to cook on a simmer for 15-20 minutes until the cranberries have burst and the mixture is thick. 14. Pour this cranberry sauce into a bowl, cover and leave until cold. 15. 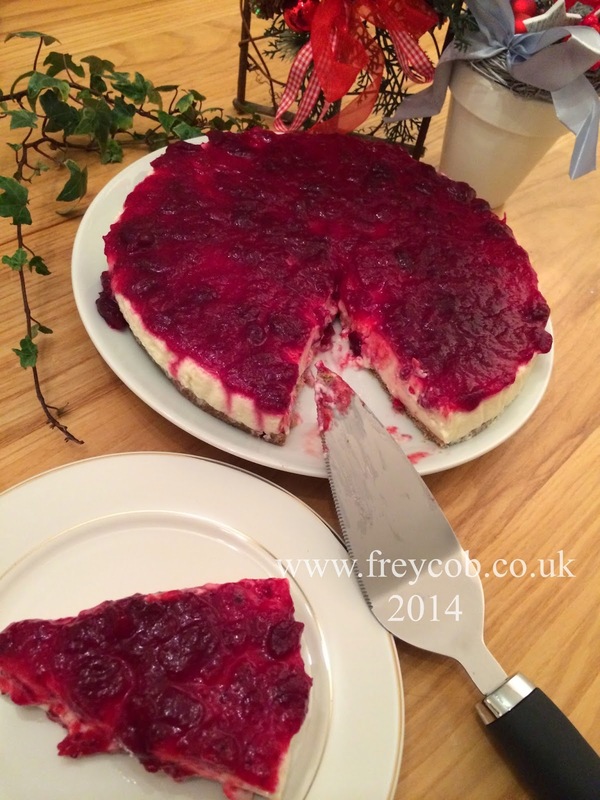 Remove the cheesecake from the ‘fridge and pour over the cranberry sauce, spreading out to an even layer. Serve chilled and enjoy the sharpness of my wobble! I was sent a box of chilled Quark with which to create my low fat, tasty seasonal dessert to enable me to take part in the Food Blogger Challenge. 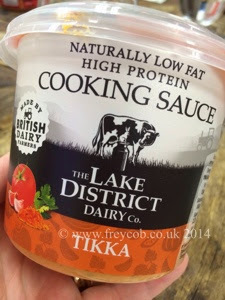 Monday evening a couple of weeks ago saw me part company with my husband & daughter as they headed out for dinner and the cinema together as I attended the Underground Cookery School to preview the new Quark sauces that the Lake District Dairy Co. will be launching in August & September. They’ll be produced in three varieties; Garlic & Herb, Tikka and Tomato & Basil. 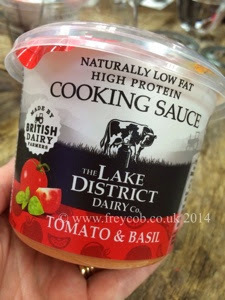 The Lake District Dairy Co. brand was first launched in 2008. In April 2013 they introduced the first 100% British produced Quark to the supermarket shelves. It’s a product that’s fairly common on the supermarket shelves of Europe, but not so much here, and since it’s launch has become one of the fastest growing products in the cheese category. Quark is a naturally fat free, low carbohydrate, low calorie alternative to dairy ingredients such as crème fraiche, double cream, cream cheese or clotted cream. It’s also higher in protein than the dairy products it can substitute, and is therefore a great ingredient replacement for those looking to follow a healthier diet, without having to compromising on taste. Quark is currently available in 3 varieties; original, lemon and vanilla. Add to this the new range of cook in sauces, and you now have the choice of 6 variations from which to choose. It can be used in both savoury and sweet dishes, so the only limitation is your imagination! First on our menu was a starter. 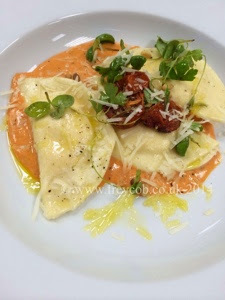 After making our own pasta, we filled it with Garlic & Herb Quark, folded it into ravioli and served it with a Tomato & Basil Quark sauce, sundried tomatoes, fresh herb leaves, Parmesan and drizzled with olive oil. 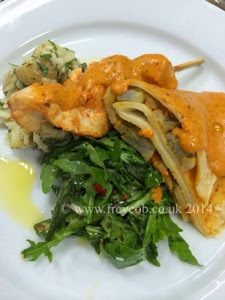 We then went on to learn how to remove the breasts and legs from a chicken which we transformed into Chicken Tikka Quark skewers served with Garlic & Herb Quark and roasted artichoke filled pancakes, as well as a potato, Garlic & Herb Quark salad, and a roquette and okra dressed salad. For dessert we made two ice creams using original Quark; a lemon one and a vanilla one, but I ate my dessert before photographing it, sorry! These sauces are proving to be very versatile. For the quick simple meal, you could simply open, heat and serve the sauce with fresh pasta or cooked chicken. If you have little more time, you can use these as the base ingredient and transform your meal into something more delicious indeed! 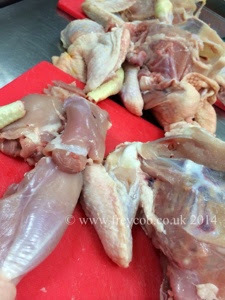 I was invited to the Underground Cookery School to take part in this event by the PR company of Quark. I was offered samples to being home to try, however I was unable to accept them as I had no refrigeration facilities in the hotel. I did, however, receive a goodie bag of utensils and menu cards with which to create the dishes we made on the night. 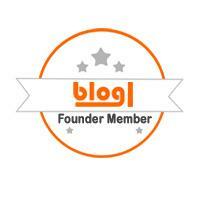 I was under no obligation to write a review of this evening or of the products we were introduced to.